Everyone likes to get on their bikes and go for a spin. However, few like to follow the rituals of exercising and then post cycling stretching or even a gym workout. Just adding the miles and climbing those nasty hills won’t make you the best cyclist. Success in cycling is built on three basic principles namely speed, strength, and endurance. Putting in some extra effort before cycling will make you a harder climber and a better cyclist. It will increase your flexibility and make you last longer. The following exercise for cyclists do not require any equipment’s, it all relies on your body weight. 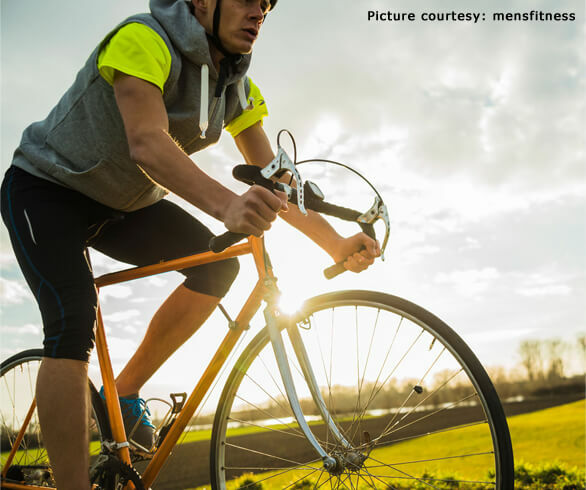 The following exercise for cyclists will strengthen some specific muscles and make soft muscles stronger. They look easy but they are not until you get a hang of it. Once you complete a circuit, you repeat the round again. As your muscles build strength you can also increase the number of reps.
Plank is one of the great forms of exercise for cyclists that builds your core strength. It builds your endurance maximizing performance while climbing. It builds your abs and works on your back at the same time. Lie face down on a mat resting on your forearms, palms flat on the floor. Push off the floor, rising up on your toes and resting on the elbows. Back should be even and straight, in a perfect line from head to heels. Tighten your Glutes and abdomen. Hold for 30 to 60 seconds, and repeat for 3-5 times. Slowly raise yourself onto tips and then slowly descend. Stand with both your feet together at arm’s length from the wall as you face it. You can use the wall for support. Repeat at least 20 times. You can also do by adding weights to the exercise. Head and back straight with hand on the hips or straight. Then slowly get back to the starting position. Repeat at least 20 times. Slowly lower yourself till knees are bent 90 degrees. Use bottom steps of a staircase or a lower bench. Start with left foot on the step and right foot on the ground. Stand straight on left leg as you simultaneously bring your right leg on the step above. After this, lower back down and start again. Repeat at least 20 times and then start again with the other foot. Sit on a sofa, bed or a bench with the back of your knee just on the edge and your feet left hanging. Lean back and with hands behind for support, slowly lift the left foot up so that it forms a straight line and lower it down again. Do at least 20 reps. Change leg and repeat. Lie on the floor/mat with your hand on the sides. 2.Keeping the left leg straight, slowly raise it higher off the floor and then slowly lower. Leg extensions, step ups and calf raises can also be done by adding weights. Moreover, there are several different modifications of plank and another basic exercise which are easily available on the internet.